La Cabronita Build... it starts! Next on the list is a Marc Rutters 1 piece flame maple neck... busy finalising neck specs with Marc. I'm going to DIY the body. It's going to be a thinline/la cabronita lovechild. Thinline hollow body construction with La Cabronita styling. I've been dreaming about this for yonks! So excited to get moving on this! Aside from finish, that's almost exactly the guitar I want to build for myself sometime soon. Haven't quite decided between the TVJ Classic or Classic+ for the bridge either. Are you going mahogany body, ash or alder? Alan Ratcliffe wrote: Aside from finish, that's almost exactly the guitar I want to build for myself sometime soon. Haven't quite decided between the TVJ Classic or Classic+ for the bridge either. I ended up deciding on the classic+ because I like the slightly more middy sounds of the plus and I like the sounds of the middle position with the classic+ and the classic neck together a bit more than just the classic neck classic bridge (plus I'm not really chasing classic tele tone, so I'm not going to miss the traditional tele bridge sound (I hope). Body will be two piece Alder body (haven't found a place that can give me a wood wide enough for a one piece). The black guitar with a f-hole just looks so classy to me! What are you thinking about for the finish? I know those clips well! Both pup combos do sound great. Currently have a guitar on test which has the C+ in the bridge and Classic in the neck and the C+ sounds perfect for the rock/rockabilly stuff, while the neck has articulation and clarity. What's making me lean a bit to the Classic in the bridge is the 'tween sound of this guitar - with both pups dialled in perfectly, the 'tween disappears a bit in the mix until you raise the neck a little or drop the bridge. That messes up the perfect single pickup a little and kills some of the hollowness ("quack", "gonk", etc.) of the 'tween. I'm being nitpicky though (as is my wont). Experience tells me that pickups with closer impedance matching should go a long way to curing this and the longer scale length and wood choices of a Tele should also change things to add a bit more snap to the 'tweens, which will help them cut through. Speak to Tommy at USACG, he might be willing to sell you a one-piece blank. 'Course that means importing... Then again, I don't think a one-piece is as important in a semi-solid body like a Thinline, where you have two fairly large cavities - if anything, a two-piece will help a little to keep any feedback under control. Always transparent for me. Most of my guitars are ambers or bursts (by luck as much as anything else). I do want something different though - another trans red or maybe blue. Black tends to obscure the f-hole. Are you going for a La Cabronita or Thinline routing and pickguard? IMO the thinline works best with the f-hole. Rear rout with no guard is another option. Thanks for your input on the pickups. Good insights to have. I read so many rave reviews for that combo that align with what I'm aiming for... holding thumbs. As much as I love a transparent finish I don't want to bite off too much to chew for my first guitar finish. I'd rather pull off a great looking solid colour. Re the f-hole. On the one hand I like the subtle look it'll have. On the other I'm toying with the idea of binding the f-hole in white. The body will have a thinline style cavity route. Top will be routed for the TV's and single f-hole. La cabronita style single ply white pickguard. The controls will be la cab style also: volume/tone/3 way knob through body. with a hot dog route at the back for access to controls. Edit: Oh, and I'm not too fussed about the 1 piece/2 piece issue. If I can get nice wood for a good looking 2 piece I'll be more than happy. I should be able to get that locally (touch wood). Alan Ratcliffe wrote: Experience tells me that pickups with closer impedance matching should go a long way to curing this and the longer scale length and wood choices of a Tele should also change things to add a bit more snap to the 'tweens, which will help them cut through. I found this to be pretty much true for the Telebration Cabronita I had with TV Classics - both with regards to two similar pickups of similar output/ impedance and the longer scale length. The middle switch position was my favourite thing about that guitar. Such a great sound through a VOX. By contrast I got try to one of those guitars you have on loan a couple of months ago and was sorely disappointed by the in between tone. Mr T wrote: I found this to be pretty much true for the Telebration Cabronita I had with TV Classics - both with regards to two similar pickups of similar output/ impedance and the longer scale length. The middle switch position was my favourite thing about that guitar. Such a great sound through a VOX. Most things sound good through a decent VOX. Good to know tho. You sold it to fund something else didn't you? Perhaps we're not being fair - as I'm comparing it to the Classic-equipped White Falcon and you're comparing to a Telebration La Cab.So, at a third to a fifth of the price, the guitar in question actually does a damn fine job. Definitely the closest thing to a real Gretsch in the low-mid price range. Saw this demo over the weekend... tv jones classic in the neck and classic plus in the bridge. I love the sound of the middle position! Rikus wrote: Saw this demo over the weekend... tv jones classic in the neck and classic plus in the bridge. I love the sound of the middle position! Good clip. Filtertrons are the king of 'buckers AFAIC. They can do it all: twang without icepick; crunch without harshness; mellow without mud; and quack without volume/presence drop. Alan Ratcliffe wrote: Most things sound good through a decent VOX. Good to know tho. You sold it to fund something else didn't you? I just have an AC15C1, so nothing too fancy. :-[ TV Classics are probably my favourite humbuckers by a long margin. I used to like and use higher output humbucking pickups, but as my musical applications have changed (drastically) in terms of style, so have my tastes in pickups (also drastically). I prefer fatter singe coils, but if I have to have humbuckers it's TV Classics or at a push, unpotted PAF style. Back to your question. No, sold it because I grew to hate it. Loved the sound, but the ergonomics were diabolical. In the specs it says "50's style slab body", which I have come to understand means "cold war torture device". The edge radius was just so sharp, I would come away with marks on my right arm and torso from playing it and after a long practice or set I'd be near throwing it. Some may say it's part of the Tele vibe, but that wasn't for me... Neck was also a little small for my liking, but I initially decided to live with it because of the pickups. Since getting my other T-style which cannot be named (two months after getting the Cabronita), I stopped playing the Cabronita. Amazing what a rounder edge radius can do for comfort, plus a neck that is more to my liking (a bit beefier). I sometimes miss the vibe of the pickups, but my current T while very different to the Cab, sounds epic so I'm not wanting in that regard. It wasn't intended as a replacement, but that's just how it worked out. Amazingly I am still sitting on the money. Even my pedal board is still the same...Not that I haven't been looking and trying, but I'm just too fussy for my own good when it comes to gear. I've been loving having a semi-hollow T, so something along the lines of a Cabronita Thinline with a fatter neck and a brass saddle Tele half-bridge (compensated of course) would be perfect for me. Agreed on all counts. Probably was being a bit harsh, but when compared to the sample at Musikmesse I found the actual production model a bit disappointing (and rather heavy for a semi IMO). Still superb value though for what you pay. Rather tasty guitar also with TV Classics, with strangely a lot of snap to the tone despite the short scale - though not as much as the Cabronita. These pickups seem to work great in pretty much whatever you put them in. No shame in that! I'm not a fan of the reverb but still a fine amp with great tone. While I'm an unabashed Blue fan, the G12M is a really great speaker and makes the amp more modern and flexible. In the specs it says "50's style slab body", which I have come to understand means "cold war torture device". Agree completely. I'd possibly have gone as far as "medieval torture device" (or "a man's guitar" in Tele-player parlance). Give me a '50s Strat 1/2" edge radius any day and at least a slight stomach (or chest in my case) contour. Alan Ratcliffe wrote: No shame in that! I'm not a fan of the reverb but still a fine amp with great tone. While I'm an unabashed Blue fan, the G12M is a really great speaker and makes the amp more modern and flexible. Agreed. It isn't as far off the hand wireds as you would think, but for a lot less money. To be precise, the reverb is actually crap when compared to Fender reverb, but it's way better than what you got in the previous series. Quite usable if you just give it a small amount of mix for ambience. The previous CC had no usable reverb tones at all. There are no negative adjectives that adequately describe the terrible reverb on the old CC series. nicovlogg wrote: Whoa! Exciting stuff! Hey Rikus, sorry for slightly derailing your thread. Very keen to see how your build goes. Mr T wrote: Hey Rikus, sorry for slightly derailing your thread. Very keen to see how your build goes. No problem! It was good discussion! 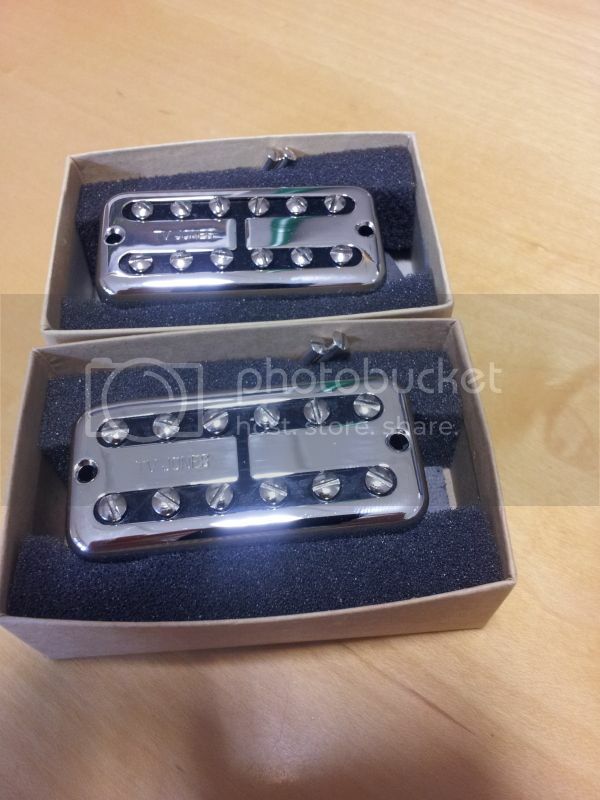 Two beautiful nickel plated pickups have arrived! !